Wunderbar German edition of The Lost Family…! 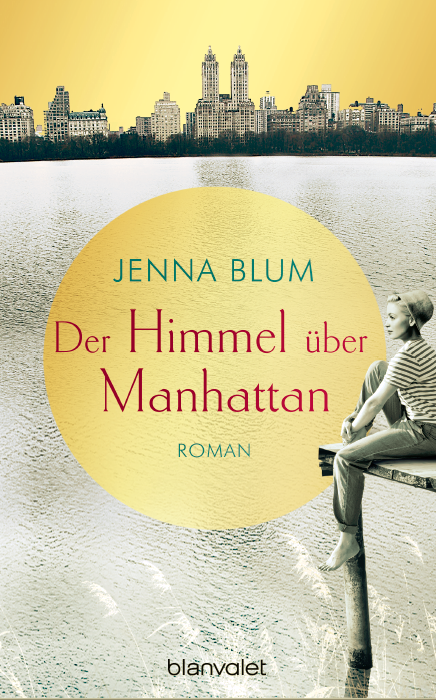 Check out this gorgeous cover for the German edition of The Lost Family—retitled “The Sky Over Manhattan.” What do you think? We think it’s sehr schoen! "Blum’s greatest success is in creating three well-rounded characters whose inability to see each other clearly causes the sorrows that inform all their lives." Thank you to The Reporter Group for this thoughtful review of The Lost Family. To read the entire review, please click here. One of our favorite reasons to read? To escape for a while! We’re therefore thrilled that Bustle named The Lost Family one of the top books to read to escape this summer. Calgon and historical fiction, take us away! For the full list, click here. We love this review of The Lost Family from the JUF-Chicago News, as multi-layered as a good Reuben in examining Jenna’s motives and inspirations for writing the novel, including her family background, the Holocaust survivors she interviewed, religion, and FOOD. To read the review, click here. We're thrilled The New York Jewish Week chose The Lost Family as one of its must-read historical novels, praising its "rich storytelling." View the whole list here. We’re delighted that the immensely popular readers’ group Great Thoughts, Great Readers has chosen The Lost Family for its September Book Club pick. To join Jenna and GTGR readers in discussing the novel on Sept. 17th at 8 PM ET, please join the group by clicking HERE. We’re so moved & thrilled by this lovely, thoughtful review of The Lost Family by BookRepoter.com—which said “Jenna’s writing is entirely delicious!” & includes a little reveal about one of Jenna’s agent’s special edits. To read the full review, please click HERE. 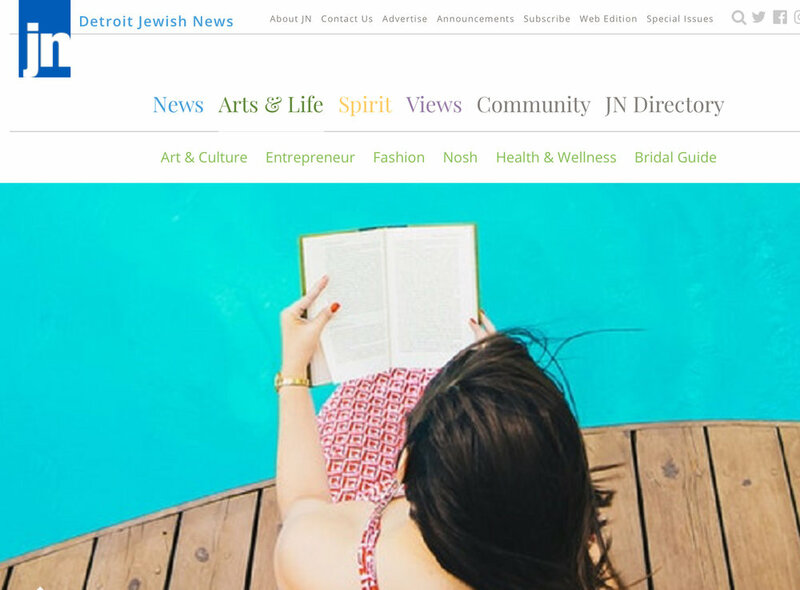 Thank you to The Detroit Jewish News for recommending The Lost Family as a summer must-read! (We’d also love to take a dip in that pool & investigate the section called “Nosh.”) To read the whole list, please click HERE. We’re kvelling that Jewish Boston has included The Lost Family in its summer must-read roundup. To see all the novels chosen, please click HERE. We are so thrilled that the venerable Publishers Weekly has given The Lost Family a starred review—the novel’s 4th starred trade review. To read the review, please click HERE. The Christian Monitor has chosen The Lost Family as one of its Top Ten picks for June, calling the novel “absorbing and emotionally resonant.” To read the full review, click HERE. The Satellite Sisters, five relalted podcast stars & tastemakers who spotlight and champion women’s issues, have chosen The Lost Family as their summer read! Tune in to their podcast JULY 3 to hear the discussion of the novel. ON WBUR 90.9’s Here & Now, Author Steve Almond (BAD STORIES) included The Lost Family on his list of summer must-read books by women, calling the novel “beautiful, sad, and wrenching.” To listen to the segment—which Jenna said raised her I.Q. and added to her TBR stack—click HERE. If you’re flying JetBlue this month, you can access a free download of The Lost Family via their web browser, FlyFi (open it, then click Books). Very friendly skies indeed! In its Best New Books feature, People says of The Lost Family, “Blum plumbs the depths of loss and love in this exquisite page-turner.” To view the page, click HERE—and/ or buy the print issue of People at your local newsstand! How long did it take Jenna to publish her first book? What did she wear in one of her early food service jobs? Is it true she doesn’t like chocolate?! Jenna’s True Confessions for the UK’s Female First HERE. In this LitHub piece, Jenna writes about how she came to be obsessed with food in books, earned her kitchen scars, and invented the menus for The Lost Family—oh, and there may be a recipe for The Lost Family’s Masha Torte (double-chocolate German Torte) included as well. To read (perchance to bake), click HERE. Bon appétit! We are thrilled to announce to our friends across the pond that The Lost Family is available NOW in the UK as an e-book from Blackfriars Books, an imprint of Little, Brown. Watch for the paperback coming in Fall 2018–meanwhile, happy e-reading! CinCIn! To purchase and download, please click here. It’s here! Publication day for The Lost Family has finally arrived. The novel is available NOW wherever fine books are sold. CinCin and happy reading! In its must-read list 6 Summer Books That Explore The Immigrant Experience, The Village Voice says of The Lost Family, “The novel spans three decades, from the Sixties to the Eighties, but Blum’s sense of tension and mystery drives the plot forward at a delightful pace. She takes on the difficult task of rendering generational trauma visible, and does it with such humor and empathy, you can’t help but be swept along for the ride.” To read the entire review—& discover more terrifically compelling immigrant reads—click here. Welcome to The Lost Family Supper Club! Until pub date on June 5th, food bloggers across America—invited by Jenna and The Book Club Cookbook—will be creating & posting dishes inspired by The Lost Family’s menus. Here’s our first guest, Camilla of Culinary Adventures with Camilla, presenting her Lavender-Salted Meringues, based upon “Masha’s Little Clouds” from the novel! For Camilla’s recipe & review (including passages from The Lost Family), please click HERE. And stay tuned—or follow #TheLostFamilySupperClub on Facebook, Twitter, and Instagram—to see what our esteemed guests cook up! The Lost Family Hardcover Arrives! Jenna was THRILLED to hold the hardcover of The Lost Family for the first time this week in the novel’s native habitat, New York! Here’s the proud new book mama with her 3rd baby—coming JUNE 5TH to you wherever books are sold. We are kvelling that the Jewish Journal has selected The Lost Family as one of seven must-read books this summer! For the whole list, please click here. Readers always wonder what inspires an author to write a novel. Here is Jenna’s guest post for Book Club Girl, in which she shares her inspiration for The Lost Family—including her intervewing Holocaust survivors for the Steven Spielberg Survivors of the Shoah Foundation. BookBub names The Lost Family one of Best Historical Novels of Summer 2018! We’re thrilled BookBub has named The Lost Family one of the best historical novels of Summer 2018. For the full list of books, please click here—and historical fiction lovers, you’d better get a bigger beach bag! Dr. Nancy Harris in the Patriot Ledger praised The Lost Family as a powerful portrait of painful PTSD offshoot survivor guilt, calling The Lost Family one of the “...novels that do an exceptionally keen job of bearing witness to the power it has to either propel an individual forward into a meaningful future, or compel them to be mired in their past.” To read the whole review and Dr. Harri’s thoughtful analysis, please click here. POPSUGAR selects the The Lost Family for its Best Summer Reads List! PopSugar selects The Lost Family for its list of best summer reads! For the full list, click here and carry a big beach bag. The Lost Family chosen as IndiePick for summer! Revering indie bookstores as we do, we're especially ecstatic to announce that independent booksellers across America have selected The Lost Family as an Indie Pick: a great read to be featured on the Indie Next List and indie bookstores all over the country. Thank you, indie booksellers! We're thrilled--and licking our chops!--to announce that Book Club Cookbook is hosting #TheLostFamilySupperClub on June 3rd! Bloggers will recreate *actual* dishes inspired by The Lost Family's menu and post the results online. To see what deliciousness they come up with, please follow #TheLostFamilySupperClub on Facebook, Twitter, and Instagram! May 2018: You've gotta love a novel that makes you cry! At least, we do. BookBub named The Lost Family one of the 14 most poignant, heart-tugging books of Spring/Summer 2018. You can read why & find the whole list here. Booklist gives The Lost Family its 3rd starred review--and compares it to Elie Wiesel. April 15, 2018: Booklist gave The Lost Family its third starred review--and compared the novel to Elie Wiesel. There can be no higher honor. Booklist commented, "...gripping...unforgettable...this deeply moving novel brings new meaning to the familiar phrase 'never forget.' " To read the full review, please click here. Library Journal gives The Lost Family a starred review! The Forward features The Lost Family on its Spring 2018 Must-Read List! March 2018: We are absolutely kvelling that The Forward recommends The Lost Family as a must-read this spring. To peruse the whole excellent list, please click here. March 2018: The Lost Family receives a coveted starred review from Kirkus, which calls the novel "...an unsentimental, richly detailed study of loss and its legacy." To read the full review, please click here. The Lost Family launches June 5th, 2018! FEBRUARY 2018: We are thrilled that actress Selma Blair is reading and loving The Lost Family, which she called "elegantly written; heartbreaking, and very charming." (Plus she was reading in bed with her dog, Cappie. How much do we love that?) Thank you, Selma! The Lost Family is a Netherlands bestseller! FEBRUARY 2018: THANK YOU for visiting the new Jenna Blum website. We hope you spend happy time here--and wish you good reading always!